Assange's US extradition fiction | Russian Legal Information Agency (RAPSI). Tags: Extradition, International, Julian Assange, Sweden, U.S.
As Assange addressed a cheering crowd of devotees surrounding Ecuador’s London embassy Sunday, he devoted much of his first public appearance in the two months that have passed since he sought refuge there to lambasting the US “witch hunt” against WikiLeaks. He refrained from mentioning the sexual offense charges pending against him in Sweden, or the extradition order issued in connection thereto. 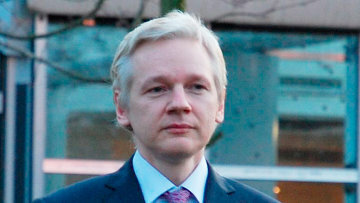 Rather he focused solely on expressing his gratitude to his supporters around the world, and his condemnation of “[t]he US administration’s war on whistleblowers,” thus highlighting his concern that extradition to Sweden would in turn mean extradition to the US in connection with leaking classified documents via WikiLeaks. Concerns relating to the death penalty in Assange’s case stem from the theory that if prosecuted in the US, he would be charged under the Espionage Act of 1917, which carries the possibility of capital punishment. Speaking with RAPSI Monday, WikiLeaks spokesman Kristinn Hrafnsson reiterated these fears. What remains to be seen however is whether the US will formally indict Assange, and if it does, whether Sweden would honor an extradition request drawn up in connection with such indictment. Dr. Mark Klamberg, Stockholm University public international law lecturer, spoke with RAPSI Monday on the plethora of reasons why the hypothetical scenario of Assange’s extradition to the US from Sweden remains highly unlikely at best. The extradition treaty currently in place between the US and Sweden entered into force in 1963, and its supplement took effect in 1984. Several key provisions could serve to limit Sweden’s power to extradite Assange to the US if the latter were to seek his extradition under the Espionage Act of 1917. In order to qualify as an extraditable offense, the offense charged must be punishable in both countries for at least two years, and must not fall into any of a number of listed exceptions, including – relevantly – political offenses. To illustrate his point, he described a case involving a man from Turkey whose extradition was sought on the basis that he had stolen money in order to purchase weapons which were slated to be used in some sort of militant attack. The fact that his extradition to Turkey was denied because the offense was regard to be a political one is illustrative of the Supreme Court’s extensive interpretation of what constitutes a political offense. Hypothetically speaking, if the US were to attempt to extradite Assange on the basis of the Espionage Act, and if the extradition were - for whatever reason - upheld despite the Supreme Court’s broad interpretation of political offenses, the potential of the US to impose capital punishment would serve as yet another obstacle to successful extradition. According to Klamberg, as a party to the European Convention on Human Rights, Sweden would be proscribed from extraditing Assange to the US if it were possible that Assange could be executed for offense(s) forming the basis of the extradition request. This would not necessarily serve as the be all and end all of the extradition question. Klamberg explained that the US could circumvent this proscription by guaranteeing that Assange would not be subject to the death penalty. The US has successfully sought the extradition of defendants from Europe in the past by way of such guarantees. Still, this guarantee would hit at the nerve of the concerns expressed this morning by Hrafnsson that Assange could be executed if required to stand trial on espionage charges in the US. Ultimately, all of this will remain hypothetical until A) the current diplomatic deadlock between Ecuador, the UK, and Sweden is resolved, and B) if and when the US decides to issue a formal indictment against Assange. 10:52 21/08/2012 As Assange addressed a cheering crowd of devotees surrounding Ecuador’s London embassy Sunday, he devoted much of his first public appearance in the two months that have passed since he sought refuge there to lambasting the US “witch hunt” against WikiLeaks.